When we started the Civic Lab at the end of this past summer, we knew one of our major goals would be to engage our community in conversations around current events and issues in a landscape with disappearing local news sources. 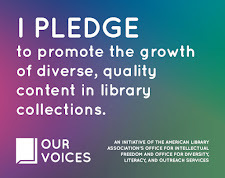 Like many libraries and other institutions dedicated to access to information, we've felt this particular goal explode in import over the past few weeks. Or, rather, it was always important; the past few weeks simply cast the need in a more urgent light. To that end, many of our staff are scouring news and current events to think about topics about which our community can discuss and learn. This past week, we focused on Standing Rock. How do the collective economic gains of the Dakota Access Pipeline weigh against its environmental impact, both actual and potential? To what extent should the protests against the Dakota Access Pipeline at Standing Rock be considered in the context of the history of interactions between Native Americans* and the United States government? How should the government respond to the presence of water protectors? It should be clear from these core questions that our goal was to provide all of the information, resources, and perspectives our patrons would need to be able to make an informed opinion of their own. This Civic Lab installation popped up for community conversation last Wednesday evening for 2 hours. In that time, we had some really outstanding conversations with patrons ranging from junior high-age through seniors, and all across the political spectrum. Those participants also ran the gamut in terms of previous knowledge they brought to the conversation; plenty had known nothing, while a small handful were already up on many of the details. While several patrons did feel the urge to identify themselves politically, none of the conversations were overtly political; rather, everyone seemed really eager (and relieved) to have conversations about issues rather than partisan posturing. Only one of our conversations lasted fewer than 10 minutes--that's the level of engagement we're talking about. Civic Lab pop-up space and several of the participants. Through the course of our conversations, we learned that 35% of the folks who stopped to talk had not heard of Standing Rock before they came to the Civic Lab. About 30% of the participants took copies of resources with them and/or expressed a desire to share what they were learning with others; one gentleman snapped some photos of resources to share on his Facebook page on the spot. And, when all was said and done, about 80% of the people who stopped to talk about Standing Rock indicated that they had learned something in the course of the conversation. What we're learning in these Civic Lab pop-ups is that our community is really interested in having thoughtful and resource-based conversations about topics--both ones they've seen a bit on the news, and ones that are totally new to them as well. Are you finding this in your communities as well? We're also learning that many patrons want to know when these pop-ups will be happening; they want to be sure they plan to come participate, and a few even said they'd do some advance research to come better prepared. 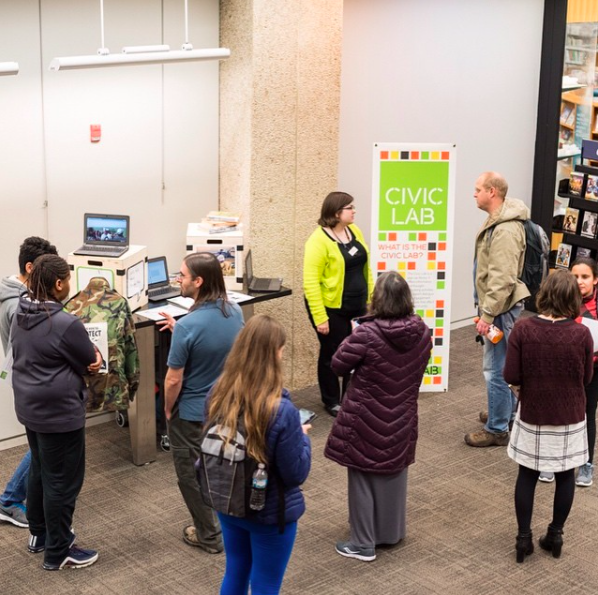 These pop-ups thus far have been true pop-ups in the sense that they aren't advertised anywhere; staff know when they're happening and on what topics (so that we can plan), but patrons participate only if they happen to be in the library when the Civic Lab appears. We're going to change that model in coming weeks; while we want to retain the flexibility to pop up around topics as they emerge, we'll take steps to advertise pop-ups on our website and events calendar (and, potentially, via social media if the topic warrants). If the people in our community want to have these conversations, we certainly want to give them tools they need to do so. Right now we're in planning stages for what's next for the Civic Lab. Staff are scouring the news and thinking about models for civic engagement that may resonate with our community. As we reflect and plan, I'd love to hear how you're thinking about civic engagement in your own libraries. *You'll note that we used the term "Native Americans" rather than "First/Native Nations" in referring to indigenous groups participating in the Standing Rock action. We used this terminology because it was the express preference of the water protectors my colleague stood alongside when he was at Standing Rock. **The #StandingRockSyllabus from NYC Stands with Standing Rock was incredibly valuable in allowing us to curate the content for the Civic Lab; if you've not yet explored it, I recommend you take the time to do so. We also looked to a variety of news sources--big networks and national papers as well as the international coverage and, particularly importantly, coverage from within indigenous communities. As I said, "I learn every day." Thanks for sharing a critical way for libraries to exercise our considerable "town hall" resource rich potential to expand conversation civilly. Great job to Skokie PL and staff!